Please note that the content of this book primarily consists of articles available from Wikipedia or other free sources online. 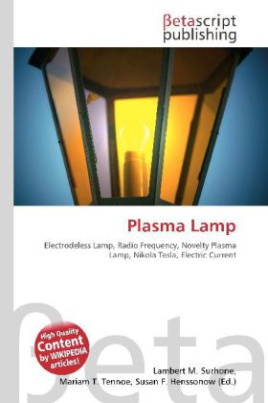 Plasma lamps are a type of electrodeless lamp energized by radio frequency (RF) power. They are distinct from the novelty plasma lamps that were popular in the 1980s. The electrode-less lamp was invented by Nikola Tesla after his experimentation with high-frequency currents in an evacuated glass tube for the purpose of studying high voltage phenomena. The first practical plasma lamps were the sulfur lamps manufactured by Fusion Lighting. This lamp suffered a number of practical problems and did not prosper commercially. These problems have gradually been overcome by manufacturers such as Ceravision and Luxim, and high-efficiency plasma (HEP) lamps have been introduced to the general lighting market.